Here is a list of supplies you will need to install your epoxy garage floor coating. Preparing the concrete surface for the GARAGE FLOOR EPOXY paint is very important. Proper adhesion by the epoxy floor paint to the concrete is critical for a successful, long lasting floor finish. If your floor needs grinding or shotblasting click on CLEANING GARAGE FLOORS to learn about that. If your floor has cracks click on GARAGE FLOOR REPAIR or if the surface is badly damaged click on GARAGE FLOOR RESURFACING to address those issues before you attempt any cleaning and painting. EPOXY GARAGE FLOOR COATING KIT - This includes an acid etching solution, epoxy floor paint, color chip additives, clear top coat with anti skid granules (usually comes separate). Measure the square footage of your space and check the manufactures coverage rate so you'll know how much to get. PAINT TRAY & LINERS - To pour the epoxy floor paint in. 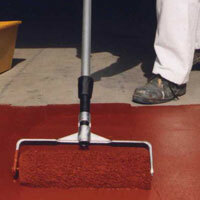 Painting concrete with epoxy garage floor coatings is about as easy as painting walls. The application of the epoxy floor coating will seem like the easiest part. Preparing the surface of the concrete floor so the epoxy paint bonds well, might be the hardest part of this process. To adhere to the concrete surface, garage floor epoxy needs a very clean and slightly rough profile. The pores of the concrete have to be opened to get a good bond. All pop outs and cracks will have to be patched. 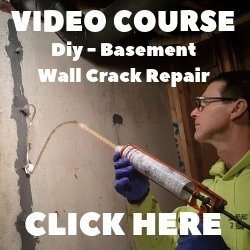 The concrete should be at least 30 - 60 days old and have a vapor barrier under it. 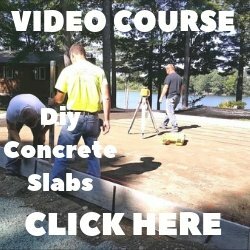 See CONCRETE MOISTURE PROBLEMS to help you understand this. You can also tell if the etching solution doesn't foam, if that's the case a chemical stripper or grinding the floor will be needed to remove the sealer. Stripping and cleaning the floor should not be rushed. Any grease or dirt will keep the garage floor epoxy coating from bonding properly. Following the steps to cleaning the surface correctly will insure the epoxy paint doesn't peel off months down the road. Garage epoxy floor coatings usually come in kits with everything you need. Decide if you'll be applying two coats and a top coat or just a single coat with a top coat. Buy enough so you don't run short. If you choose to add color flakes this will help hide any imperfections in the floor. You might want to add anti skid granules that give the surface a sandpaper like surface, slipping on a wet or snowy surface isn't fun. Once the epoxy garage floor coating is mixed you'll only have a couple of hours to work with it. Plan out in advance where you will start and finish for best results.